Do you have a Harry Potter fan in your family who would love to see Daniel Radcliffe on stage? Then today is your lucky day. 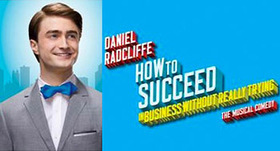 A great new celebrity charity auction hosted by CharityFolks.com is giving you the chance to bid on two tickets to How To Succeed in Business Without Really Trying, the play starting in New York in 2011 staring Radcliffe. The package also includes a backstage tour and a signed poster. How to Succeed in Business Without Really Trying centers on a young window-cleaner, J. Pierrepont Finch, who begins a meteoric rise from the mail room to Vice President of Advertising at the World-Wide Wicket Company. Finch’s unorthodox and morally questionable business practices jeopardize not only his career but also his romance with Secretary Rosemary Pilkington. Proceeds from the auction will go to the Transport Group Theatre Company, a New York City-based, Drama Desk and OBIE Award-winning Off-Broadway theatre company, which develops and produces plays and musicals, both new works and revivals, that explore the American consciousness in the 20th & 21st centuries. The auction runs until December 15, and can be accessed here.